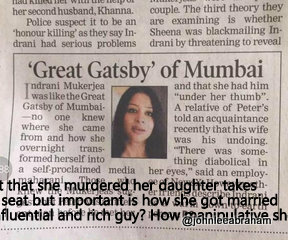 The sensational Sheena Bora murder case has divided the country into three camps - one who think the 25-year old was murdered by her own mother- Indrani Mukerjea; another that have no clue what is going on; and a third, who are disgusted at the 'rabid' witch-hunt launched by the Indian media. While there is no denying that the story is intriguing and deserves the attention but coverage should be based on fact. But till now the reporting has been bizarre, macabre and in some quarters downright witch-hunty. Indian media not only has gone overboard in handling the stories, and in some twisted way it is actually punishing "Sheena" by mixing up the facts with fiction. The line separating yellow journalism and truth has brazenly been erased by the TRP seeking "story-tellers." While the investigations on the case is still on, most media houses already have passed their judgement, and have found Indrani guilty. The coverage - of the sensational murder case - in any other country would have been illegal, where the court could hold the media in contempt for "prejudicing or interfering with proceedings." The handling of Sheen Bora case just goes to show that we have not learned the lesson. 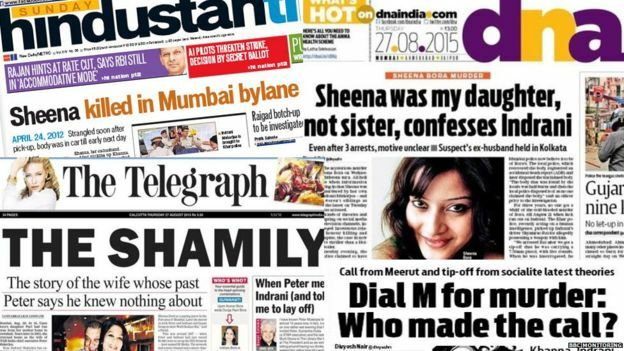 The 2008 murder of the 14-year-old Aarushi Talwar, remains the most "shameful" chapters of Indian journalism that shows how news gossips are being packaged as "hard news". The myopic baseless "pulp" news stories spurned out by gossip writers, quoting unnamed dubious sources, fed the curious perverted imagination of the masses. They destroyed the dignity of a dead child, all in the name of "Freedom of Press." While in the Great Wide West there is a clear demarcation on tabloid newspapers and hard news dailies; sadly no such distinction exists in Indian media, where all news channels and newspapers hunt together as a pack of 'mangy rabid dogs' with no decency and shame. In UK, The Sun and The Guardian do a splendid job on catering to their specific readers while maintaining their respective journalistic stance. 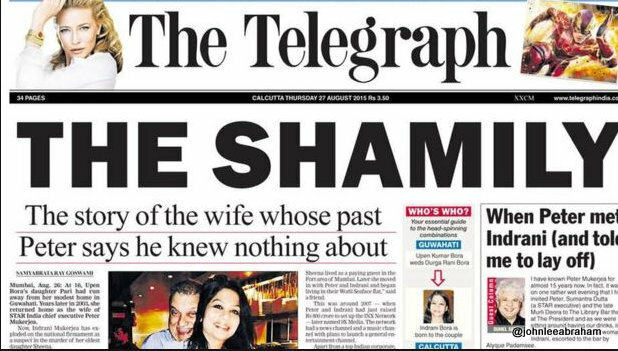 But that is not the case in India and Sheena murder case has proved it to us that even respected news publications such as The Telegraph could not resist the temptation. Instead of being the Fourth Estate, Indian media today behaves as a rich obese kid, who loves nothing but the junk. He is gaining mass, expanding from all places but what the growth is actually harmful and does no one any good. In their vain attempt to out do their competitors, news televisions channels come up with baseless allegations without even thinking the repercussions of such claims on the lives of the individuals concerned. In some way Indian media turning it the very Khap Panchayats that it so often ridicules. Our so-called journalists are no better than these backward Khap leaders, when they pass judgement without even understanding the issue. But who do we blame really? While pointing at the greedy televisions channels is an easy way-out, the real culprit is the silent audience, who 24/7 is being forced fed - in the name of "Breaking News" utter useless content. The problem is the media does not take THE PUBLIC seriously and it will continue to do so, till somebody shakes down the structures of the existing so-called "fourth estate" of our society. VIDEO: Viral Clip Shows Young Elephant Fight off 14 Lions Alone! Who said Lion is the king of the jungle? After watching this video you will surely change your mind. This extraordinary YouTube video, shot by the guests on the Norman Carr Safaris in Zambia's Chinzombo Camp, has become the last online sensation.On the last count the video have had 17,224,946 views and was still gaining. The baby elephant - now being hailed as Hercules after Greek hero - bravely fended himself against the predators. Assaulted by 14 hunting lions, Hercules - new KING OF THE JUNGLE, literally gives a lioness a run for her life. Fearlessly it fought back the onslaught and finally managed to live another day. For long the debate has been raging on bringing a more flexible Foreign Direct Investment policy in Defence. However, for long there has been a constant opposition towards any decision to increase FDI cap in India. Recently, the commerce and industry ministry sent in a circular calling in for inter-ministerial consultations to raise FDI limit in defence sector to 100 per cent through the approval route. In the past, the move would have been bogged down by its opponents; however, this time there is a sure chance that the FDI could be brought in 100 per cent in defence. It was back in May 2001 that the Indian government threw open the defence industry to the private sector. The policy permitted 100 per cent equity with a maximum of 26 per cent FDI component, and in it lay its defeat. It clear from the start that the policy won't attract the investors for a simple matter of fact that which investor would venture into a country where he could not significant control over his company, but face all risks with no absolute guarantee whether the product will be purchase at all or not. And by 2004,the government was forced to confess that it has not received even a single investor. Those opposed to 100 per cent FDI raise security concerns as an issue in allowing the flexible policy in defence. But what they forget is the fact that at present India procures almost all of its critical weapons system from outside. But by allowing FDI in defence, India can ensure that company's deliver what they have promised,further it can insulate itself from any sought of embargo. And to curb any malpractise, the government can easily bring in necessary security clauses in the license,including the right to take over a facility if required in an operational emergency. Since currently, the equipments for the defense services are imported, it causes considerable burden on India's foreign exchange. Experience has taught us, these multi-billion deals often bring in corruption, but 100 per cent FDI can curb such practises. And by having the foreign defence units in India, the country can strengthen rupee by saving the foreign exchange and over a period of time, these defence weapons can be exported out of India. By bringing in full share FDI, the government will be able to create couple of million jobs and which in turn will add 2 per cent to India's GDP. The FDI in defence will bring in a severe competition for India's research agency -Defence Research and Development Organisation (DRDO). Even after spending crores of rupees on R&D, the public sector under-taking's performance has been below par. By bringing FDI, the government can create a competitive atmosphere for the DRDO and its agencies,that would then be pushed towards bringing in path-breaking products.